IS IT TRUE that the Zionist leaders in Switzerland and Turkey received this offer with the clear understanding that the exclusion of Palestine as a destination for the deportees was based on an agreement between the Gestapo and the Mufti. IS IT TRUE that this response to the Gestapo's offer was made with the full knowledge that the alternative to this offer was the gas chamber. IS IT TRUE that in 1944, at the time of the Hungarian deportations, a similar offer was made, whereby all Hungarian Jewry could be saved. IS IT TRUE that the same Zionist hierarchy again refused this offer (after the gas chambers had already taken a toll of millions). IS IT TRUE that during the height of the killings in the war, 270 Members of the British Parliament proposed to evacuate 500,000 Jews from Europe, and resettle them in British colonies, as a part of diplomatic negotiations with Germany. IS IT TRUE that this offer was rejected by the Zionist leaders with the observation "Only to Palestine!" IS IT TRUE that the British government granted visas to 300 rabbis and their families to the Colony of Mauritius, with passage for the evacuees through Turkey. The "Jewish Agency" leaders sabotaged this plan with the observation that the plan was disloyal to Palestine, and the 300 rabbis and their families should be gassed. IS IT TRUE that during the course of the negotiations mentioned above, Chaim Weitzman, the first "Jewish statesman" stated: "The most valuable part of the Jewish nation is already in Palestine, and those Jews living outside Palestine are not too important". Weitzman's cohort, Greenbaum, amplified this statement with the observation "One cow in Palestine is worth more than all the Jews in Europe". There are additional similar questions to be asked of these atheist degenerates known as "Jewish statesmen", but for the time being let them respond to the ten questions. These Zionist "statesmen" with their great foresight, sought to bring an end two two-thousand years of Divinely ordained Jewish subservience and political tractability. With their offensive militancy, they fanned the fires of anti-Semitism in Europe, and succeeded in forging a bond of Jew-hatred between Nazi-Germany and the surrounding countries. These are the "statesmen" who organized the irresponsible boycott against Germany in 1933. This boycott hurt Germany like a fly attacking an elephant - but it brought calamity upon the Jews of Europe. At a time when America and England were at peace with the mad-dog Hitler, the Zionist "statesmen" forsook the only plausible method of political amenability; and with their boycott incensed the leader of Germany to a frenzy. And then, after the bitterest episode in Jewish history, these Zionist "statesmen" lured the broken refugees in the DP camps to remain in hunger and deprivation, and to refuse relocation to any place but Palestine; only for the purpose of building their State. The Zionist "statesmen" have incited and continue to incite an embittered Jewish youth to futile wars against world powers like England, and against masses of hundreds of millions of Arabs. AND THESE SAME ZIONIST "STATESMEN" HEEDLESSLY PUSH THE WORLD TO THE BRINK OF ANOTHER TOTAL WAR - REVOLVING ENTIRELY AROUND THE HOLY LAND. What may befall the Jewish inhabitants of Palestine, of the Arab crescent, Europe, or the USA; is of no concern to these Zionist leaders. The rising anti-Semitism in the Western World is the product of their "statesmanship". Under the guise of "love of Israel", the Zionist "statesmen" seduced many Jews to replace devotion to the Torah and its Sages with devotion to the scoundrel who founded Zionism. It is of no little significance that Herzl originally sought conversion of the Jews as a solution to the problems of the Diaspora. When he realized that this was not acceptable to the Jewish masses, he contrived Zionism as a satisfactory alternative! A look into history reveals that this very same type of "statesmen" opposed the call of Jeremiah the prophet to yield to the minions of Nebuchadnezzar at the destruction of the first Temple. Five centuries later, Rabbi Yochonon Ben Zakai appealed to the people to surrender to Titus the Roman to avoid bloodshed. The "statesmen" rejected this appeal, and the second Temple was destroyed by the Romans. --- And now for the past fifty years, the Zionist "statesmen" rebuff the leadership of our Sages; and continue in their policy of fomenting anti-Semitism. When will they stop?? Must every Jew in America also suffer?? - Even the Nazi monsters had more sense, and gave up their war before all Germany was destroyed. The Zionist "statesmen" ridicule the sacred oath which the Creator placed upon the Jews in the Diaspora. Our Torah, in Tractate Ksubos, folio 111, specifies that the Creator, blessed be He, swore the Jews not to occupy the Holy Land by force, even if it appears that they have the force to do so; and not rebel against the Nations. And the Creator warned that if His oath be desecrated, Jewish flesh would be "open property", like the animals in the forest!! These are words of our Torah; and these concepts have been cited in Maimonides' "Igeres Teimon", "Be'er HaGola", "Ahavas Yehonosson", and in "Toras Moshe" of the Chasam Sofer. Yidden - merciful sons of merciful fathers - how much longer must holy Jewish blood continue to be shed?? The Jewish people must reject, outright, a "Jewish State". The Jewish people should accept the US compromise. We must depose the atheist-Zionist "statesmen" from their role as Jewish leaders, and return to the faithful leadership of our sages. We beseech the Nations to open all doors to immigration - not only the doors of Palestine. 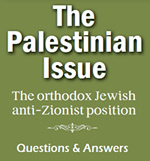 Peaceful, non-Zionist religious personalities in Palestine, (particularly from the native population) and their counterparts in the Diaspora, should engage in responsible, face-to face negotiations on behalf of the Jewish people, with the British and the Arabs; with an aim of amicable settlement of the Palestine issue. Faithful Jews- for over three and one-half thousand years, in all parts of the world, through all trials, our grandfathers and grandmothers marched through seas of blood and tears in order to keep the Faith of the Torah unswervingly. If we have compassion for ourselves, for our women and children, and for the Jewish people, we will maintain our golden legacy today. We have been sentenced to exile by the King of Kings because of our sins. The eternal blessed be He, has decreed that we accept the exile with humble gratitude until the time comes, or until we merit His pardon through repentance if we seek to end the exile with force, G-d will catch us, as our sages have forewarned, and our sentence becomes longer and more difficult. Many times in the past have segments of our people been defrauded by false messiahs - but none of the false messiahs has been as fallacious and delusory as the lie of Zionism. With our historical experience as our guide, no retribution has been or will be greater than the retribution for giving credence to Zionism. If we wish our exile-sentence commuted, we must appeal through repentance; and through total physical and spiritual observance of the Sabbath, laws of family purity, and study of Torah. Let it be clearly understood that never in Jewish history (even in the time of Jeroboam or Achav) have such hostile atheists stood at the helm of he Jewish people as today. How can we plead to the Almighty for mercy while we tolerate these vile, "wicked" leaders as spokesmen! Beloved brothers - let us cleanse our ranks and cleanse our midst; let us entreat the Almighty through prayer, repentance, and fulfillment of mitzvos that He alone redeem us, immediately.